Recent E-15 ribbon cutting at "Jetz on 70th" with federal, state, and local officials. Notice the prices. The following interview took place between Aaron S. Robertson and Bob O’Connor on November 14, 2016. Mr. O’Connor is, along with his cousin Tim Klein, co-owner of O'Connor Petroleum Co., Inc. Jetz Convenience Centers, a growing chain around the metro-Milwaukee area, is a subsidiary of O'Connor Petroleum Co.
Jetz, along with the Wisconsin Biofuels Association, recently collaborated to introduce E-15 fuel to the state of Wisconsin. Mr. O’Connor explains the implications of E-15 for our health, our vehicles, the Wisconsin farmer, and our economy. The interview took place at the Hales Corners Jetz location, and was transcribed by Aaron’s colleague, Ashley M. Weber. A: Welcome! This is Aaron Robertson here. I am with my friend and business associate, Bob O'Connor. It is a beautiful Monday morning--it's sunny out. I can't believe we're holding on strong with this weather going into mid-November here. It's 10:00 on Monday morning, November 14th. 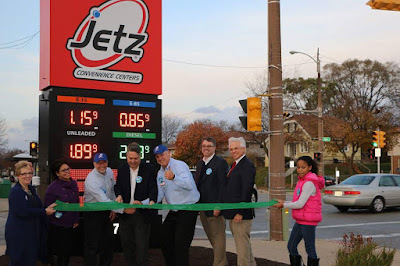 Bob, along with cousin Tim Klein, is co-owner of O'Connor Petroleum Company, which owns and operates the Jetz brand of convenience stores throughout the metro-Milwaukee area. We're getting together today to talk about an exciting thing happening here in Wisconsin. Jetz is going to be, along with significant help from the Wisconsin Biofuels Association, introducing a new fuel blend called E-15 to the metro area and to the broader state. This is an exciting opportunity for consumers, fuel producers, and those that are environmentally-conscious. It's a really-interesting development that's taking place. Bob, welcome! B: Thank you, Aaron. Yeah, just a couple things--I do notice it is a blue, clear, clean, sunny sky, and Jetz is doing everything we can on our part to see it continues like that. And just for record keeping here, yes, I am president of O'Connor Petroleum Company and O'Connnor Petroleum Company is the parent of Jetz Convenience Centers. So O'Connor Petroleum is doing business as Jetz Convenience Centers. A: Great, so let's start with your business. I understand it's a family-owned, multi-generational business. You currently have four locations--three of them currently branded as Jetz. Tell us more, fill in the gaps, talk about your business. B: Yes, I am the third generation of my company. Myself and my cousin, Tim Klein, both lead Jetz Convenience Centers. We are both grandchildren of the original founder, Robert O'Connor Sr., who started the company on 92nd and Hampton on the Southeast corner of Timmerman Airport. We've been around since 1957. Like I said, Tim and I are the third-generation. My daughter, Mary, is the fourth generation of our company to be in leadership. She manages our Hales Corners store. A: Great, and that is where we are this morning, at the Hales Corners location. It's a beautiful area and a fine community. How did your business come to spearhead the introduction of E-15 to the state of Wisconsin? Who did you talk to, and what were those conversations like? What can you share about what was taking place in the background? B: Sure. The State of Wisconsin has an interest in creating more fuel choice, along with some environmental issues that they would like the fuel that we select to address. So Jetz is what we call in our industry "unbranded." So we do not have the traditional ties to big oil, like Exxon, Mobil, BP, Shell, you name it, although we do have one store that's Shell for the moment. We just bought that store. So, there have been concerns both for the environment and the amount of choice that consumers have. There is actually an office in the State of Wisconsin called the Office of Energy Innovation that is constantly looking for new and better choices for Wisconsin consumers. They, along with the American Ethanol Coalition, approached us and asked us if we would have interest in promoting E-15 through a new grant that the state has put together to help introduce this fuel. A: So break down the mechanics of E-15 for us. What is the composition, what kind of vehicles can take it, which ones can't? Fill in the gaps for us from that standpoint. B: 'E' stands for ethanol, which means there's ethanol blended in that gasoline. 15 stands for the percent of ethanol and is typically the 'up to' percent. So E-15 will be up to 15% ethanol and it'll have 85% typical gasoline. Now, two things happen when you add the ethanol. Number 1: You get a higher octane, so actually at our South 70th Street store, where we're introducing this, you'll get a midgrade octane. But the price will typically be lower than just regular unleaded gasoline. Right now, I believe we're a nickel cheaper, and that can fluctuate with markets. There's an ethanol market and a gasoline market, and they don't work together – they work independently of each other. Typically, ethanol has been a less-expensive fuel than typical gasoline. So we're able to save you money, and get you a little more power at the pump. Now, what vehicles can use it? Well, the EPA has said that any vehicle 2001 and newer can use it. If you are earlier than 2001, it's illegal to use it. You're not to use it in a weed whacker. You're not to use it in a boat. You're not to put it in your motorcycle. It's a newer, advanced fuel for newer, advanced vehicles. A: So, that beautiful, '88 Lincoln Town Car that you and I were discussing that I just purchased from Holz here in Hales Corners can't take E-15, it sounds like? B: 1988 – I'm sorry [laughs]. A: I will be missing out on this exciting opportunity. B: However, you do have a newer Lincoln, as well. B: And what year is that? A: That is an '09 MKZ. B: That would qualify for E-15. So just as an explanation--you are burning ethanol in your gasoline right now. In southeast Wisconsin, we are mandated to have reformulated gas, and reformulated gas is blended with up to 10% ethanol. So we are already burning ethanol nationwide – about 97% of our vehicle fuels are running ethanol already. It is the most expeditious way to get cleaner air than what we have at the moment. A: What are some of the most common misconceptions you are hearing right now about E-15? Obviously, it sounds like this is taking on the traditional oil and fuel industry, and I'll bet there's going to be a lot of misinformation, misconceptions, whether intentional or not, right? B: With respect to E-15, it's a new fuel, so there hasn't been a lot put out on it yet. Yourself, myself, and others, the State of Wisconsin, is putting out information. Jetz is putting out information. The Office of Energy Innovation is putting out information. American Lung Association is putting out information. Wisconsin Biofuels Association is putting out information. The American Ethanol Coalition is putting out information. Oil companies, you have to understand, with respect to ethanol, it's a competitor to the oil companies. So, when I sell E-15, that means 15% of the gallon in your tank that typically went to the oil companies, now goes to the American farmer, specifically Wisconsin farmers. They get that advantage of that 15%. Or if you are buying E-85, which is ethanol 85 up to 85%, 85% of that revenue is going back to Wisconsin farmers. A: So I understand you and your team have put together some very informative online resources for consumers to learn more about E-15, and as you just mentioned, it seems like there are other organizations, government agencies, etc. starting to come out with more information. What are some of these Web addresses where people can go, people can turn to, to learn more? B: Well, you can always go to JetzRewards.com. That's our Webpage, or on our Facebook feed, which you can find right on our landing page. You'll see the conversation that is going on about E-15, and I have specifically invited others in the industry to address the concerns that consumers are having. So if there is a question, go ahead and throw it on our Facebook feed – it's JetzRewards on Facebook. Put your concern on there, and we'll get you a real answer. Otherwise, you can go to FuelingWisconsinForward.com. I've created that Web site as a place that we can direct people to various pertinent information as different things come up. I might link that to different sites that address the majority of the questions – we just don't know what they will be yet. But that's what that site will do. Also, if you are wondering if your car is specifically warrantied for E-15, because some are, some aren't. It is a new fuel. You can go to EthanolRFA.org, and you can see specifically if your car is warrantied. Most cars will be out of warranty and they are allowed to use it, as long as it's 2001 or newer. But if you want to know if you are specifically warrantied, you can go to EthanolRFA.org. A: Alright, very good. What are we looking at in terms of a time table? When are these pumps expected to be put in? When can consumers start buying? B: Well, you can buy today at Jetz on South 70th Street. We put the first one in in Milwaukee. In other states where they have introduced E-15, for example, Iowa, up to 25% of the station's gallonage will go to that fuel, and a lot of people are using it as a premium substitute because, like I said, you are getting a midgrade octane for less than the price of unleaded. So if your car is fortunate to qualify for E-15, you are basically getting more bang for your buck. A: So basically, for those that are concerned about octane levels for whatever reason – maybe they have an older V-8, maybe they're driving more of a performance-based car – purchasing E -15 would be like the equivalent, I guess, of a traditional 89 octane? B: Yes, our E-15 is blended at 89, so you are getting a midgrade octane/power level, and you're getting a little more horsepower out of it than you would a typical 87, and typically it'll be cheaper than regular, unleaded gasoline. A: Are there any other thoughts at the moment? Anything else you'd like to share? B: So I think the story of ethanol is a great story, and I say that for four main reasons. Number 1: Ethanol is locally produced. Last week, I went and I visited an ethanol planet out in Cambria, Wisconsin. On my way there, I saw the farmers all out in their fields harvesting their corn. And what they do then, is they drive to the ethanol plant and they line up their trucks to deliver corn. The ethanol plant then accepts that corn. They basically just open the bottom of their trucks and the corn drops in the ground and the ethanol plant starts making things with it. The first thing they do is they make human food out of it. That's where they get the most money, is if they can turn part of that corn into human food. They extract that part and turn it into human food. Next on the line would be animal feed. So they produce a high-protein animal feed at the plant, and that generates a little more money, too, than the ethanol would. Then lastly, they take the ethanol and they put that through a distilling process which is all-natural forces of nature. It's basically bacteria that transforms the corn mash into the alcohol that we burn. So what you'll see is on one side of the plant, you'll see the farmers delivering the corn, and on the opposite side, you'll see there might even be the same truck picking up animal feed to take back to the farm, or it might be a tanker picking up ethanol to mix with conventional gasoline here at Jetz. B: So that's one thing – it's locally produced. Another thing about ethanol is that it's clean. Ethanol puts far less Co2 emissions and other contaminants into the air than conventional gasoline. That's why the American Lung Association is behind it. I'm sure if you go to their Web site, you'll find information on there. It's cleaner, locally produced, it's typically cheaper than unleaded gasoline, so as far as your pocketbook, it's good for that. And lastly, it gives you more power. So you are getting more power for less money. More bang for your buck, as I call it, on a locally-produced, cleaner fuel. I just don't see the downside – unless you're an oil company. A: Yeah, wow, this is all truly interesting. It sounds like the economic implications are just huge. If people are healthier, people are breathing cleaner air, farmers are getting the economic support that they need, this is just one more viable product that they can sell and take part in distributing. B: I call it Wisconsin gold. Corn is a solar-powered, renewable fuel. We are putting that into our mainline fuel system now. We are keeping the money right here in Wisconsin. We do export ethanol to other states, which allows money to flow back into Wisconsin. Instead of taking our money and giving it to the oil companies, which in many cases, distribute that overseas, we are keeping it right here in Wisconsin. So we're supporting our Wisconsin farms. We support our Wisconsin ethanol plants. We support our local transport trucks. We support our local gasoline retailers like myself. A: Incredible. Well, thank you for sharing. This is really fascinating, especially for nerds like me that are interested in business and economics and marketplaces, and that's why I wanted to sit down and have this conversation with you in more detail, and hopefully my readers appreciate it and they learn something new. B: When you choose ethanol, Aaron, you are choosing something for yourself, you're choosing something for your car, you're choosing something that's better for the environment, and you're choosing something that is going to support your neighbor economically. It's a good story. A: You said that you already put in at least one pump at the Milwaukee location (South 70th Street)? B: No, all our fuel dispensers have E-15 and E-85 right at them. We are the first ones to put these pumps in the state of Wisconsin, and what you will find at our pumps at that particular location right now is there will be five selections to choose from. So there will be five buttons instead of the typical three. You will have E-85, E-15, 87, 89, and 93 octane. A: So it's all ready to go. B: It's all ready to go. A: People can start buying away. B: Correct. Now, we're having a grand introduction on November 18th, this coming Friday, between 3 and 6pm. We're going to be offering discount pricing, so 85 will be 85 cents a gallon and E-15 will be $1.15 a gallon. Plus, we will be giving away some gift cards. We will be giving away a $100 gift card every hour between 3 and 6. A: That's awesome! Well, any final thoughts, I guess? B: Nope, that should cover it. But you're welcome to ask me more later on, if you'd like. A: Yeah, and I hope people do. I hope they get excited; I hope they get encouraged. I hope this interview further helps not only your marketing for your business, but further helps in disseminating good information out there, as well. It sounds like a win-win for everyone, for those that are environmentally-conscious, and for those that simply want to be a little healthier. B: Or they just want a lower price for a little more power. A: Yeah, and definitely good for the Wisconsin farmer it sounds like, too. B: If you want to join in on the conversation, go to Jetz Rewards on Facebook and ask us whatever you'd like, and we'll see if we can get you a good answer. A: Alright Bob, appreciate it. Thank you so much. B: Very good Aaron, thank you. Great information. Can't wait to try it out!